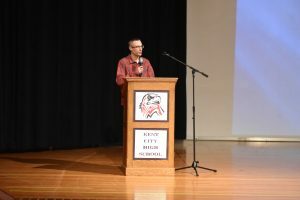 Despite being moved from Friday to Saturday, the Kent City Athletic Hall of Fame Ceremony did not disappoint with latest class of four individuals spanning 20 years. 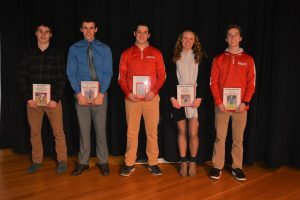 As always, the student-athletes led the ceremony, presenting details of each individual’s accomplishments to the audience in the High School Auditorium. 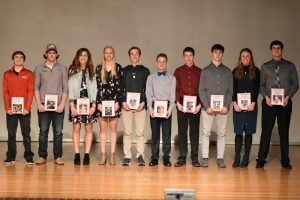 Prior to introducing the Hall of Fame class of 2019 we took a moment to recognize the student-athletes from 2018 who earned All State honors. We had a very successful year with 13 student-athletes earning All State, some multiple times! 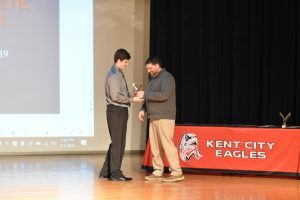 Senior Evan Jones presented Jacob Thompson, who was the first wrestling state champion in school history at Kent City, as well as All-State in football for the O.K. Silver Champion and District Finalist 2001 squad. 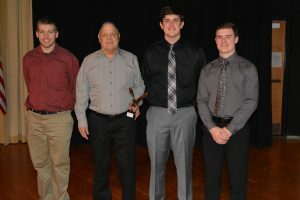 Jones commented that it was wrestlers like Jacob Thompson who help to motivate the current wrestlers when they enter the wrestling room each day for practice. Varsity Wrestling Coach Chad Kik also joined Evan on the stage to reminisce on the outstanding career of Jacob Thompson at Kent City. He talked about how prior to his state championship match, the lights went out at the Palace of Auburn Hills. Coach Kik also talked about how Jacob’s confidence helped him succeed. Finally, Coach Kik had a message from former varsity football coach, Steve Mclintock, who said no one outworked Jacob Thompson in the off-season, he was a beast in the weight room among other things. Upon accepting his award, Jacob had some advice for current student-athletes. He talked about learning from failure is what has, and continues to drive him. Jacob mentioned he can still remember every match he lost in high school, and it was those matches that drove him get to where he finished in high school and where he is at today as a successful businessman. Sophomore Kenzie Bowers presented Shannon Carlson, and first talked about how her (grandmother in particular) family was excited she was chosen to speak for her, as they recalled what an amazing student-athlete Shannon Carlson was at Kent City. Former softball coach, Bill Vanhorn also took to the stage to tell some stories about Shannon’s brilliance as a softball player and also how she was a bit of a prankster as well. He commented on how in all of his years of coaching softball, he does not think he has coached a better short stop considering what Carlson was able to do with both a bat, but also as a fielder. We also heard from former girls basketball coach Jackie (Thomas) Nickel via video from Virginia. Coach Thomas recalled the leadership Carlson brought to the teams, especially as she (Coach Thomas) was a young coach. Carlson set a pace in practice that would push her teammates to excel and often helped make in game decisions for the team. Shannon and her brother Scott Carlson were in attendance to accept the award. Shannon was thankful for the honor. 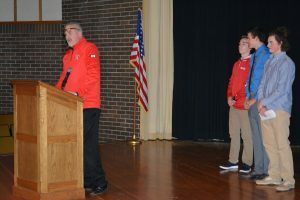 Junior Eli Carlson and senior Brenden Geers presented Adam Anderson, one of the most successful basketball players to ever take to the court at Kent City High School. Both Carlson and Geers discussed the amazing resume that Anderson compiled both at Kent City and beyond. We also heard from Anderson’s former high school basketball coach, Roger Bearup via video, who talked about how it was not easy for Anderson in high school because of the pressures that are put on a student-athlete with his abilities. Coach Bearup applauded Anderson for his handling of all of the hype and his work ethic that only magnified his natural gifts. Anderson’s collegiate coach, Edgar Wilson, also took a moment to congratulate Adam for joining the Kent City Athletic Hall of Fame with his brother Cory and his success following his years at Ferris State University. Coach Wilson also recalled the “tough love” he gave Adam while he was competing at Ferris State University. Adam was unable to attend the ceremony because he was traveling with his family. His nephew, Brenden Geers accepted the award on his behalf. Geers said that having an uncle like Adam has played a major role in his success as a student-athlete at Kent City. Senior Lauren Freeland helped induct Alex Wilson into the Kent City Hall of Fame. 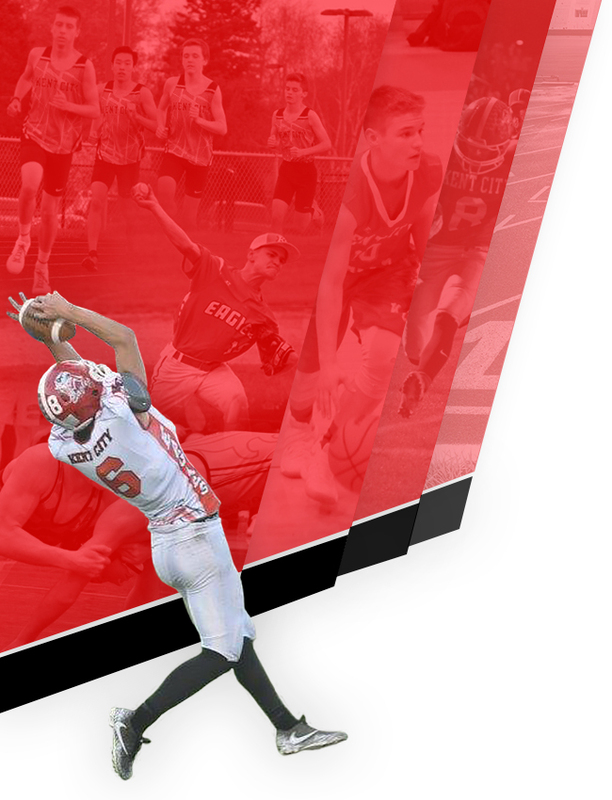 Wilson earned all-state nine times (XC and Track) including three individual state championships in track and field. Freeland recalled how Wilson was there for her at the Cross Country State Finals, encouraging her through out the course (he is faster then nearly everyone there) and coaching her, even though he is not a coach for Kent City. We also saw some clips from his state champion 1600 meter race, heard from his high school track and field coach Jeff Wilson, his coach at Michigan State Walt Drenth, and Coach Jill Evers. Coach Wilson talked about how Alex was always willing to do what was best for the team, even though it sometime required a lot of running! Coach Drenth talked about how Alex is an avid scrapper and it was always interesting to see what he would bring back with him after a long run. He also mentioned that Wilson helped elevate Michigan State’s running program, leading them to the National Championships during his time there. Coach Jill Evers talked about how Wilson’s love for running has turned into a career for him and they still correspond over the happenings in the running world. Alex was in attendance to accept the award and thank those who helped him get to where he is today. He was very thankful to grow up in Kent City and talked at length about how he misses the community. Currently the head cross country and track & field coach at Rochester College, Wilson uses many of the lessons he learned here in his current profession. 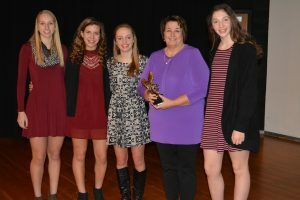 Established in March 2014, the Kent City Athletic Hall of Fame is now in its sixth year of existence. 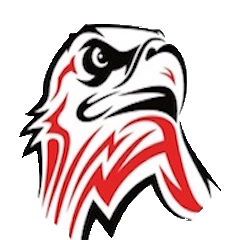 Since its inception, the Kent City Athletic Hall of Fame Committee has chosen 22 individuals and two teams to cement their place in Kent City Athletics’ history. This year, four individuals will take their rightful place in the Kent City Athletic Hall of Fame. On Friday, February 8, we will hold a formal Kent City Athletic Hall of Fame Induction ceremony following the Kent City vs. Morley Stanwood basketball games in the High School Auditorium. Leading up to our ceremony, we will highlight our newest inductees at our varsity basketball games in our Game Day programs and on www.kentictyathletics.com. 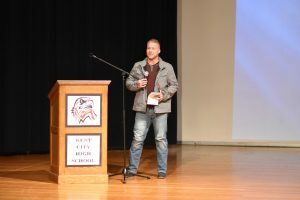 Inducted in 2019, Jacob Thompson was Kent City’s first ever state champion in wrestling and was an All-State football player on the first team to win an MHSAA playoff game in school history. Led Kent City to the school’s first MHSAA playoff victory in 2001 with a 16-14 win over Hesperia in the first round of the playoffs. 2001 Football Team earned a share of the conference championship, the only time Kent City won the O.K. Silver in football. Earned Special Mention All-State at Running Back as a senior (2001). In both his junior and senior seasons he was named 1st team All-Conference in the O.K. Silver and 1st team All-Area in the Advance newspaper. During his senior year, he was on the Grand Rapids Press Dream Team. Rushed for 1,413 yards on 200 carries including 17 touchdowns and 6 catches for 23 yards in 2001 (senior season). Set the single season record for rushing yards (1,413 yards), rushes attempts (200 attempts), and total yards in a season (1,436 yards) in his senior season. During his junior year (2000) he carried the football 179 times for 1,033 yards and also recorded 7 catches for 123 yards . Wrestling team won two O.K. Silver Team Championships and two MHSAA District Championships. First wrestler for Kent City to win a state championship in 2001. 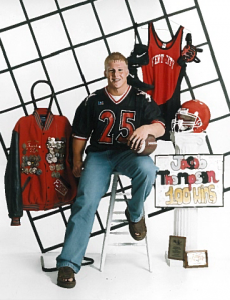 Earned All-State in wrestling three times: 1999 (7th place), 2000 (3rd place), and 2001 (1st place). Two time MHSAA Regional champion: 2000 and 2001. All-conference in wrestling during his sophomore (1999), junior (2000), and senior (2001) seasons. Career record in wrestling of 166-38 which was the previous school record. Also held records for career take-downs (316), season take downs (127), season tech falls (7), and season record (50-1). Have we left someone out? Please help us by nominating those student-athletes, coaches, and teams from Kent City. Nominations for the 2020 Kent City Hall of Fame Class will be accepted until Monday, December 9, 2019. Inducted in 2019, Adam Anderson was a standout on the basketball court at Kent City earning All-State honors and finishing his senior season as a finalist for the much coveted Mr. Basketball award. Led Kent City High School to a 54-14 record in three seasons on the varsity including one NCAA co-championship (1996-1997) and an outright league championship (1997-1998). In his senior season, the team won a school record 21 straight games and was the first team in Kent City history to go undefeated in league play. Earned 1st team All-State in the Associated Press, Detroit News, and Detroit Free Press during his senior year (1997-1998). Finished in 5th place in the voting for Mr. Basketball in the State of Michigan, the only Kent City student-athlete to ever be a finalist for this coveted award. Scored 1,093 points during his varsity basketball career. During junior season (1996-1997) earned Honorable Mention All-State. 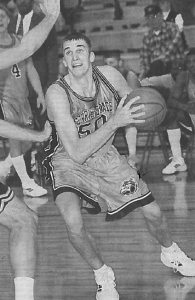 Earned Honorable Mention All-Conference in the Newaygo County Athletic Association (NCAA) in his sophomore year, and then 1st team All-Conference honors in the Newaygo County Athletic Association and 1st team All Area in the Muskegon Chronicle in both 1996-1997 (junior season) and 1997-1998 (senior season). Following his senior year, he was a McDonald’s All-American candidate and a member of the Grand Rapids Press Class C Dream Team. Played in the Basketball Coaches Association of Michigan (BCAM) All-Star Game as well as the Team USA Junior team in London, England. Attended Ferris State University where he played basketball for four seasons. Earned 1st team All-Conference three times in the Great Lakes Intercollegiate Athletic Conference (GLIAC) as well as two times on the GLIAC Defensive Team and two times as the GLIAC Player of the Week. Named to the NABC/Chevrolet All-District Team, Honorable Mention on the Street and Smith’s Preseason All American Team, and Daktronics NCAA Division II All-Great Lakes Region. Scored 1,597 points, had 142 blocks (school record), had 616 rebounds, 482/724 from the free throw line and recorded 555 field goals. Team captain for two seasons. Played basketball professionally overseas in the Egyptian League (2003-2004) and in the Bahrain National League (2005). Joined the Grand Rapids Flight in 2005 in the International Basketball League (IBL) and later the Battle Creek Knights in 2006 where he recorded the most dunks in a season. As has become customary, we used our current student-athletes to present each inductee into this year’s Hall of Fame. Here is a quick run-down of each of our four inductees. 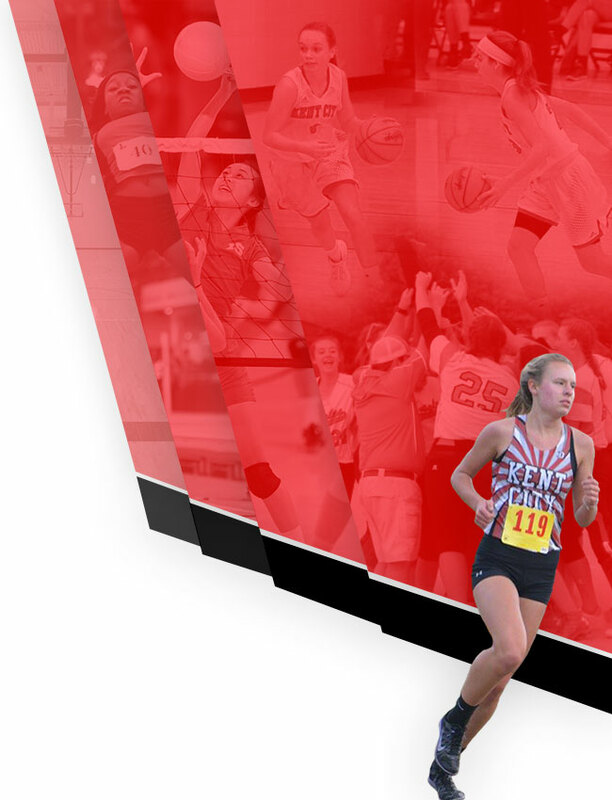 A standout for Kent City in basketball and track and field, Christine (Wolter) Dunnuck scored 1,000 points in high school and in college at Grand Valley State University. Christine mentioned that she was thankful for the education she received while at Kent City Community Schools. She noted that she actually went to Grand Valley State on a track and field scholarship, but was able to work out a deal with the GVSU Athletic Director to earn a scholarship as a basketball player since it was her first love. She also talked about the importance of outworking opponents, especially at the collegiate level. The 1933 Boys Basketball Team fell in the state finals by one point in overtime, 17-16. Coached by C.B. Leaver, Kent City won 29 out of 32 games over a two year span. Rick Stockhill spoke on behalf of the team because his grandfather Wayne Speese was on the squad. Rick said his Grandfather often reminisced about the team and its members, saying he made a number of lifelong friendships on the team. He also highlighted the coach, C.B. Leaver and how he would scout opponents to determine where on the floor they took their set shots from. Coach Leaver was far ahead of his time. Rick concluded his speech thanking the committee for keeping the memory of this team alive forever. A three sport athlete at Kent City, Walt Elliott earned state wide recognition in basketball and track & field. Walt thanked his teammates for always pushing him to get better. Elliott mentioned that Kent City had a very good 1/4 miler who helped to make Elliott better at the 880 yard dash because they would push each other in practice. Elliott felt the same way about basketball, mentioning each member of the team. Troy Pelak excelled at every sport played. An All-State golfer, Kent City finished as state runner up in both his junior and senior seasons. 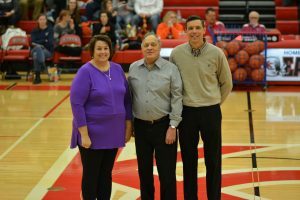 In basketball, Pelak was also All-State, scoring over 1,000 points in his career and leading the team in rebounds during his sophomore, junior, and senior seasons. In the spring, Pelak earned All-State status as a pitcher. Pelak played two seasons of basketball and two seasons of golf at Aquinas College. Troy stated that there was no better place to grow up than Kent City. He talked about developing a strong work ethic here because of the support of the staff and community. Pelak also discussed learning to use his failures to come back even stronger.